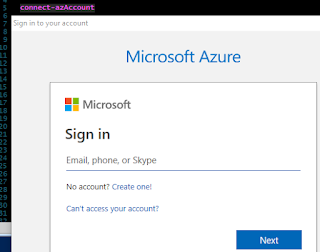 When I first heard SQL Server Virtualization, I made an assumption that it is a new feature of SQL Server that provides Virtualization at SQL Server Level, that is not the case. SQL Server Virtualization is nothing but running SQL Server Instance on Virtual Machine. SQL Server Virtualization is one of the hottest topics these days, especially after Microsoft has launched Microsoft Hyper-V (AKA Microsoft Hyper-Visor) and VMware ESX Server. In more technical terms Virtual Machines are also known as Hyper-Visors. As far as SQL Server is concerned, there is nothing specific you need to configure on SQL Server for Virtualization. The only configurations are made using Virtualization Software and sometimes system BIOS. The Original HyperVisor was developed at IBM in the 1960s called CP/CMS. Type 2: Native or Bare-Metal. Type 1 hypervisors are the common virtual machine monitors mostly used. 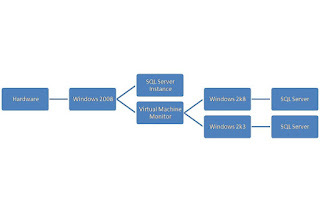 In this scenario, Virtual Machine Monitor or VM tool is installed or Hosted on Operating System. This is why it is called Hosted Virtualization too. 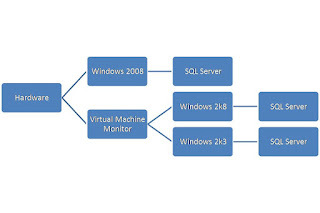 Thus Virtual Machine Communicates with Operating System for all of its resources Requirements. VMware Server, Microsoft Virtual PC are some of the famous Virtual Machine Monitors. Following is the basic architecture of Hosted Virtualization. Type 2 hypervisors run on host's hardware and communicates directly with the Hardware instead of communicating with hardware through Host OS. The hardware resources and I/O are shared among virtualized OSs. That is why it is also called Bare-Metal Virtualization. It is also possible to assign specific devices to specific Virtualized OS, this is called partitioning. VMware ESX Server, Microsoft Hyper-V, Citrix Xen, LynuxWorks are some of the software available in market. Following is a basic architecture of Bare Metal Virtualization. Why or Why not use SQL Virtualization. When Total Cost of Ownership is your concern then Virtualization is the answer. Since virtualization runs on single set of hardware, thus the cost of buying new hardware can be reduced. Also need to consider that the performance of Virtualization will not be as good as running individual machine, because SQL Virtualization does not only includes SQL Server, it also includes Operating System, and other required tools for OS and SQL Server. There can be three priorities of an organization, Performance, Integrity, Cost. If Performance is only concern then avoid using virtualization because at some point you may notice lack of enough resources to run environments in virtualization. If integrity or cost is the concern then one may consider virtualization. Virtualization is a nice technology and can save hundred thousand of dollars for organization, though there is downside too. If planned wisely, the downsides can be avoided. The best ever plan for most of the organizations can be consider deploying SQL Virtualization on Development, UAT or any non-production environment and avoid deploying SQL Virtualization on production environment as much as possible unless you have one of the best hardware that can give good performance even if multiple OS are installed with SQL Server. Installing multiple instances on same Operating System should also be considered while planning for SQL virtualization.